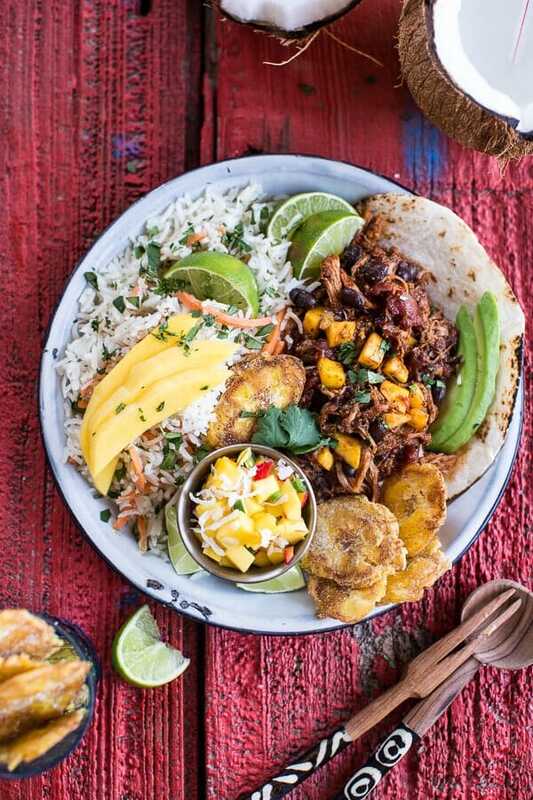 Caribbean Mango Pork and Tropical Rice Plates. 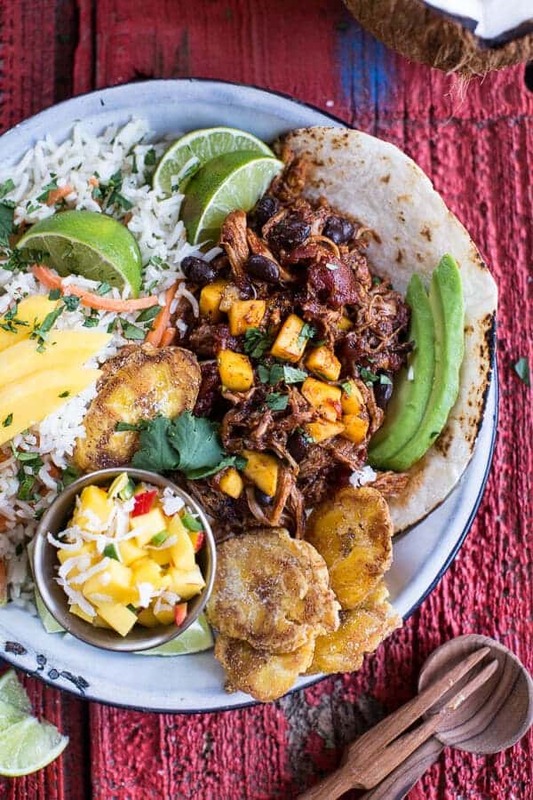 Let’s talk about tropical food today. I know it is nothing new around here, but I can’t help it, tropical foods are simply the best! Ok, and I guess I am especially excited about them today since I am on my way to Florida for a week of warmth and sun (hoping for some awesome hot and sunny weather!). This means that I will be taking my tropical food craze to addiction level. You can pretty much guarantee that I will have eaten my weight in mangos, pineapple and coconut by the time I return home in a week. Pretty excited. Anyway, I am probably going to try to keep things a little less lengthy this week since I promised little Miss Asher that I would give her my full and undivided attention for the next seven days. And trust me, if you know Asher then you know she will hold me to this. We have big plans – dying Easter eggs, hanging by the pool, shopping with Nonnie, more hanging by the pool, munching on mangos and pineapples, sipping seltzer water out of fancy tropical glasses (topped with cute umbrellas and fruit…of course) while Nonnie drinks her wine, making Shirley Temples, making cookies, more pool time, having a spa day. Basically just everything fun that sisters can do together, we’ve got it planned. Mostly though, I really just want to be outside, in the sun and sweating (gosh, I love the heat) and hanging with my family. ANYWAY. 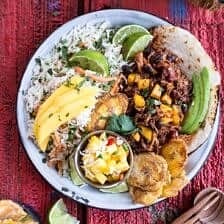 I made these Caribbean mango pork and tropical rice plates a little while ago, but when I found out I was actually headed somewhere tropical I decided I would wait to post the recipe. This way I could talk about tropical things and actually be pumped that I am about to be (or maybe even in, depending on what time you are reading) a tropical place. These plates are probably one of my favorite recipes. Like favorite, favorite. FAVORITE. It has all the things I love. 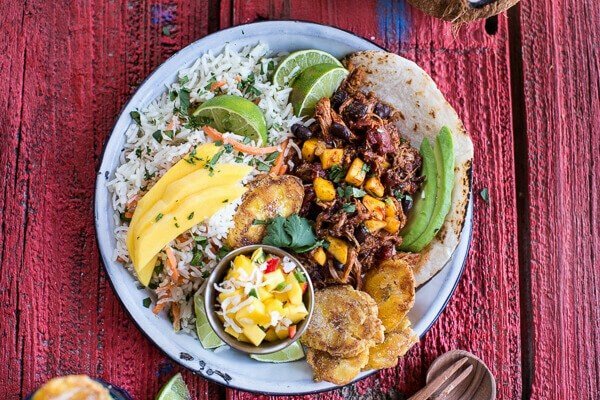 Tons of flavors, loads of texture, rice, garlic tostones (plantain chips), slow cooked pork, black beans, COCONUT and MANGOS. 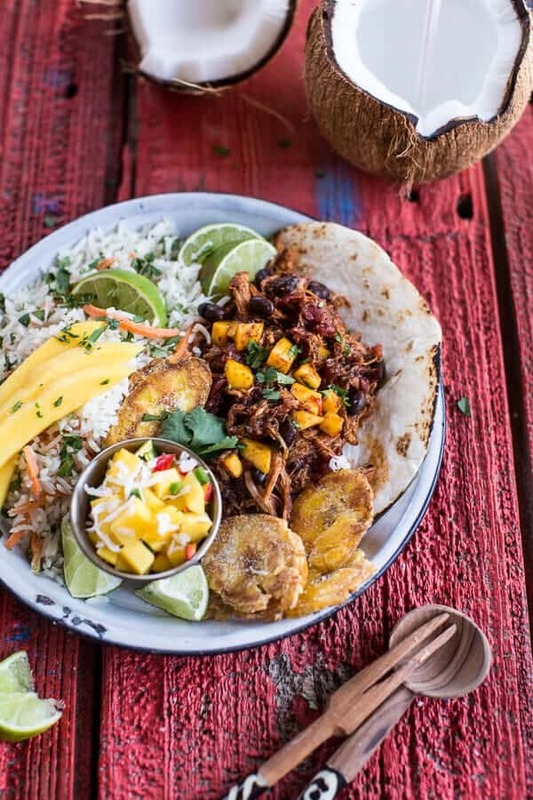 It’s literally Caribbean on a plate. AND it’s pretty easy to put together. YES. You can make the pork in the oven or in the crockpot. I chose the oven just because I decided to sear my pork for a little extra flavor, but both ways are delish. You basically just throw all the ingredients for the pork into a pot and cook low and slow. Aside from making some tropical rice, that’s it. Then put it all together on a plate and call it a day. I also made some homemade garlic tostones or plantain chips (whatever you want to call them). I LOVE these crunchy/sweet/salty chips, but you do not NEED them. I mean, I surely do, but you know, I am a little freakish. I am not sure if you can buy them in the store or not, but if you can, you could always go that route too, especially if you are looking to save time. Making them yourself really is not hard though…just sayin…I think they are so worth it. Such an easy recipe for a busy weeknight dinner and totally perfect for any of those cold (and possibly even snowy) spring days, when we all just wish we could be sitting on the beach and chilling (sorry guys!). Trust me, I so know that feeling and this meal got me through those feelings. No seriously, it did. Make it, try it, dream about tropical things and love it!! See, Monday is actually looking pretty awesome! Gosh, I love when that happens. Heat a heavy bottom dutch oven pan over medium-high heat and add olive oil. Season the pork all over with salt and pepper. Once hot, add pork to dutch oven and sear on all sides until golden brown (about 2 minutes per side). Remove the pot. Add the crushed tomatoes, ketchup, chili powder, cumin, smoked paprika, cinnamon, all-spice, cayenne pepper, orange juice, soy sauce and molasses. Place a lid on the pot and place in the preheated oven. Roast the pork for 3-4 hours or until the pork is falling off the bone and shreds easily. Shred the pork in the pot and toss with the sauce. Discard and fatty pieces. 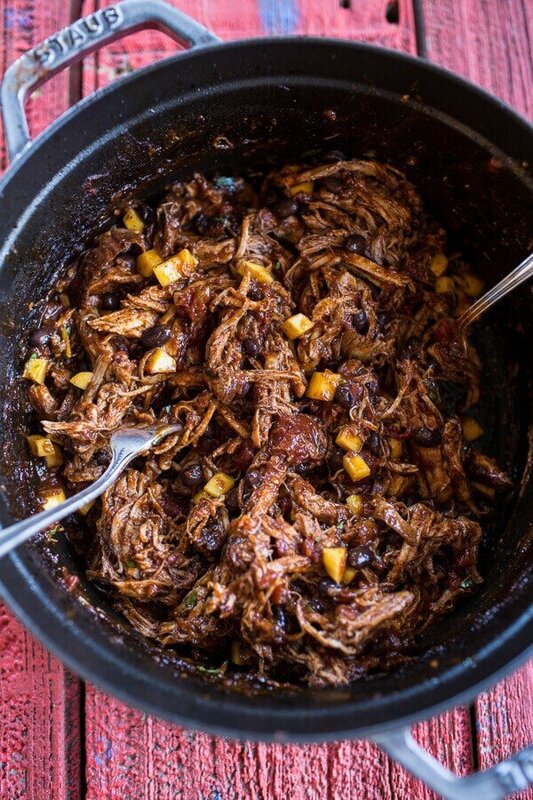 Add the chopped mango and black beans and toss with the pork, cover and keep warm. Add the pork to the bowl of your crockpot. Add the crushed tomatoes, ketchup, chili powder, cumin, smoked paprika, cinnamon, all-spice, cayenne pepper, orange juice, soy sauce and molasses. Cover and cook on low for 7-8 hours or on high for 4-6 hours. 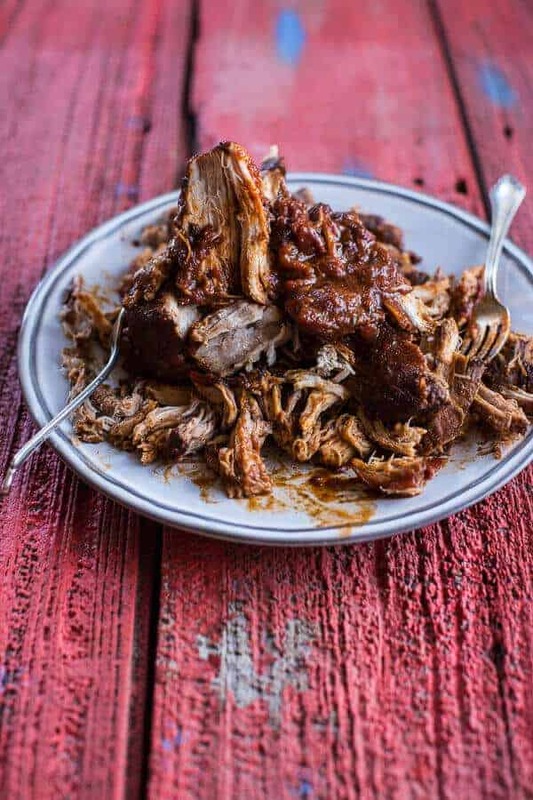 Shred the pork in the crockpot and toss with the sauce. Discard and fatty pieces. Add the chopped mango and black beans, toss with the pork, cover and keep warm. About 30 minutes before you are ready to eat make the rice. Add the coconut milk and coconut water to a medium size pot. Bring to a low boil and then add the rice, salt, unsweetened coconut and coconut oil. Stir to combine, then place the lid on the pot and turn the heat down to the lowest setting possible. Allow the rice to cook ten minutes on low and then turn the heat off completely and let the rice sit on the stove, covered for another 20 minutes (don't take any peeks inside!). After 20 minutes remove the lid and fluff the rice with a fork. Add the lime juice + zest, carrots and green onions, toss. Add a handful of cilantro and toss once more. Divide the rice among plates. Add a tortilla/pitta to each plate and top with shredded pork. 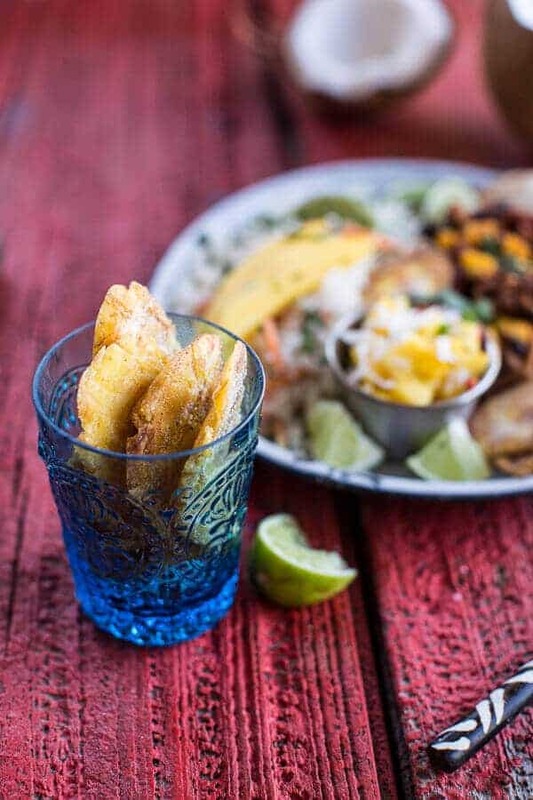 Toss on some plantain chips/tostones. 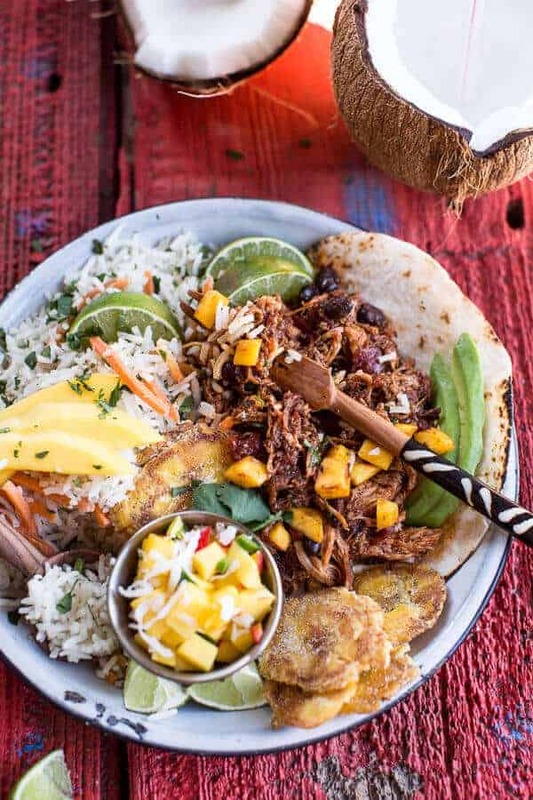 Serve with extra mango, shredded coconut, lime and sliced avocado. It’s the mangos, they put a smile on my face. Always. 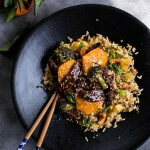 Orange Teriyaki Beef with Pineapple Edamame Fried Rice. Monday IS looking awesome! All of these tropical flavors going on are making me wish I was going to Florida too! These plates look amazing! Hope you and Asher both have a great Vacation! I am heading to Florida in May and now I am even more anxious to go! In the meantime, I am gonna have this tropical bowl of love to to tie me over. Gosh. So beautiful! GAH! Florida! How I miss living there with it’s sunny weather and palm treats! I may be ( a lot) jealous of you right now. I think I am going to have to drown my sorros in 2 PLATES of this fabulous pork! 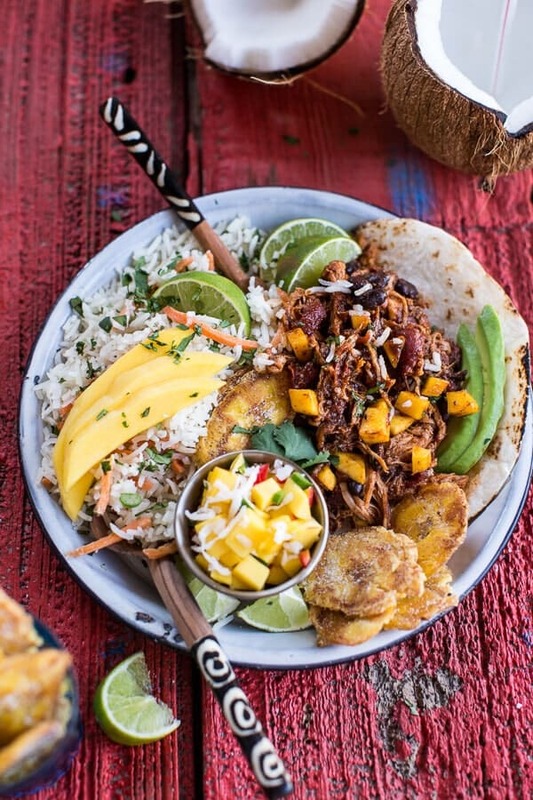 Bring on all the tropical goodness…pinned! 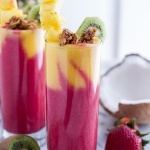 This looks so yummy and tropical..can’t wait to try I’m with you on the mangos and pineapple can’t stop eating them…Have a blast with Asher these will me memories she’ll have forever.. Hoping your having a wonderful time with Asher and Nonnie (that’s what my kids call my mom!) This pork looks incredible! I think I might just make it this week since it’s lightly snowing outside right now – I need a little tropics in my life! 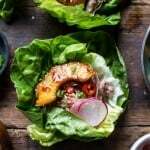 This little tropical dish looks divine! Loving all the wonderful spices from smoked paprika, to cinnamon and cayenne pepper. All-spice has had my heart for a long while; I cook with it all the time. I hope you have a great time in Florida. I know you work super hard on this blog and otherwise, it is nice to know you will take some time to be with family and to simply kick your feet up by the pool. Enjoy! GAH!! I could so use a plate of these this morning!! I’ve decided you need to open a restaurant so I can come and eat these things. 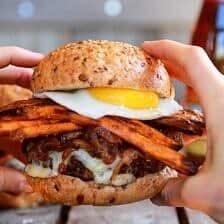 I pin so many of your recipes and there’s not enough time to make them all! I’ll just order one of everything and be fat for a day. Or week. Bring on the tropical food! And if the rest looks anything like this, we’re in luck! Have fun on your trip! 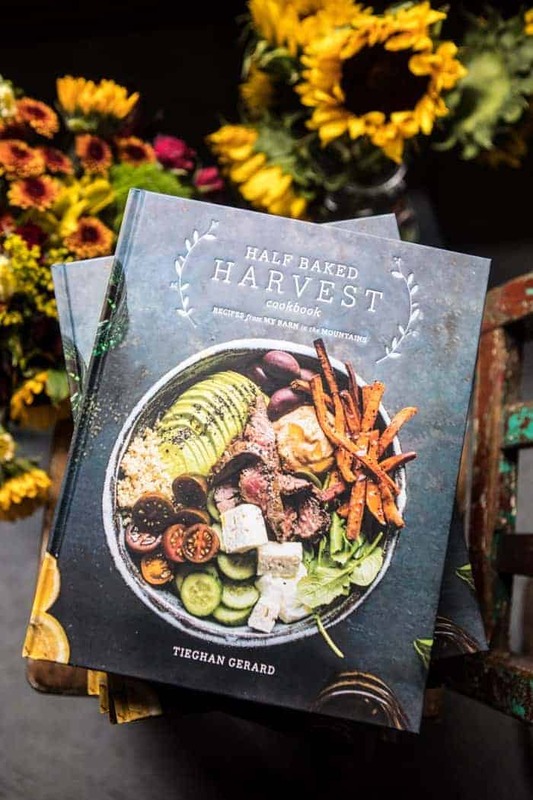 Can’t wait to make this Tieghan, it looks amazing! I hope you’re enjoying Florida and sun and time with your fam! Great post. It’s a two-for!! The post is worth it just for the rice recipe. YUM. Enjoy your sister time. Wish I had one…. I made this tonight and it was amazing! I am vegetarian so I replaced the pork with spaghetti squash. It was a great substitute and turned out amazing. My husband was stunned that I actually successfully made rice as well. Thanks!!! I love when you do tropical food! These plates are just what I’m craving! I made this last night and let me tell you this was fantastic. My husband is pretty picky and he said “please make this again” Thanks !!!! WOW! I made the pork out of this recipe and it was flat out delicious!! I used the slow cooker method but seared off my meat first (I have a wicked slow cooker that also sears, roasts and bakes) and it was just incredible. Interesting mix of flavors and love the sweet bits throughout! 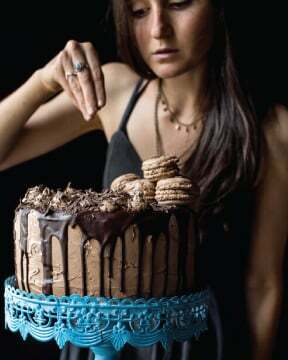 I can not WAIT to make this. Saying it looks amazing is an understatement. 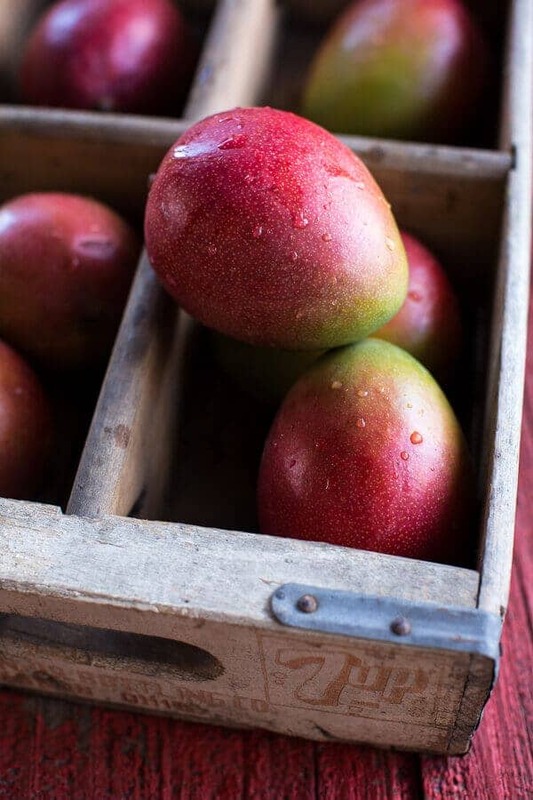 Mangos. Coconut. Plantain chips. Heaven. Heaven. Heaven! 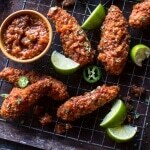 #Yes Having grandparents from Barbados, and a father who grew up in South America, this recipe is calling my roots! Thanks for posting. what is for dinner tonight? THIS is for dinner tonight! I am from the Caribbean and we do not cook pork like this at all. I guess this is more “Caribbean Inspired Pork”!. 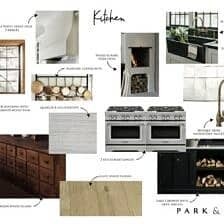 From the type of recipes you have on your site, you might find it interesting to visit mine. 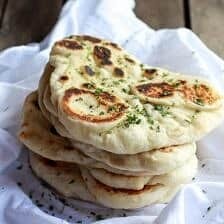 The photos are not as professional as yours, nor is the web page design (just started in April) but the recipes are a type of fusion cooking that mixes Caribbean, Lebanese,Indian and English cooking. Would certainly welcome your feedback. Can I make the tropical rice the day before? I stress out when I have to do things when guests arrive. I am also doing the pork the day before and will add the black beans and mangoes before I serve when reheating the pork. What do you suggest? Yes, you can make the rice a day in advance. Making the pork in advance will be great too! It will develop better flavor this way! Let me know if you have any other questions, thanks! Omgosh this looks incredible! 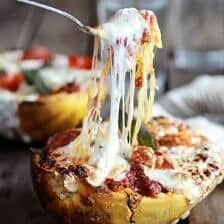 I definitely want to make it, however I have a question about the rice. 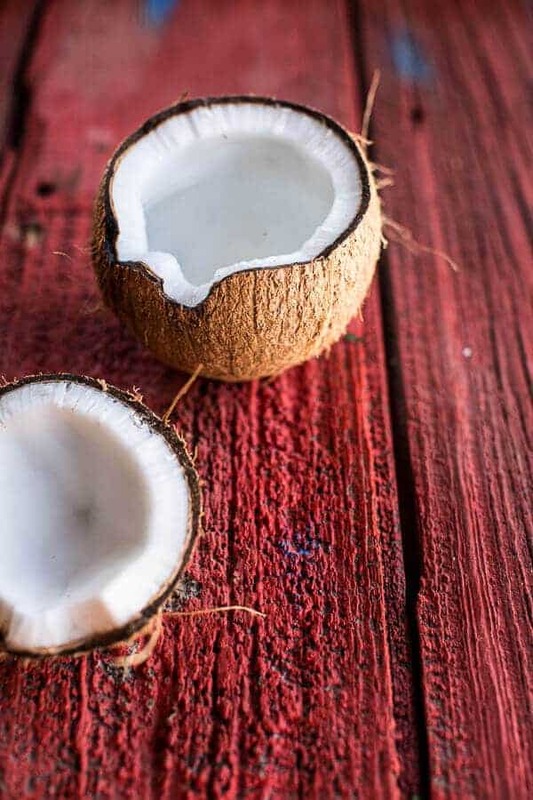 I like the flavor of coconut, but not the flaky texture, if I remove the flaky coconut, should I add more of something else to balance the taste?